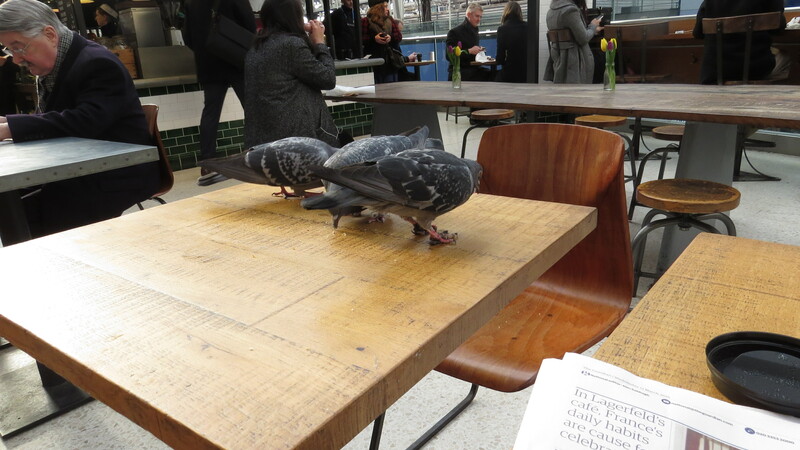 Dear Readers, when I was at Waterloo Station last week waiting for a train, I was very impressed by the cheek of the local pigeon population. No sooner had I found a seat than a bird descended to peck over the rubbish left by the previous occupant. Before long, s/he was joined by a couple of friends. The man clearing the tables half-heartedly waved them away, but they were back within seconds, clearing up the almost invisible crumbs left behind. What always worries me about urban pigeons is that they are often in a very sorry state. The first bird to arrive was in excellent condition. His feathers were smooth, his orange eyes were bright and, most importantly, his feet were perfect. But this couldn’t be said for the other two birds. 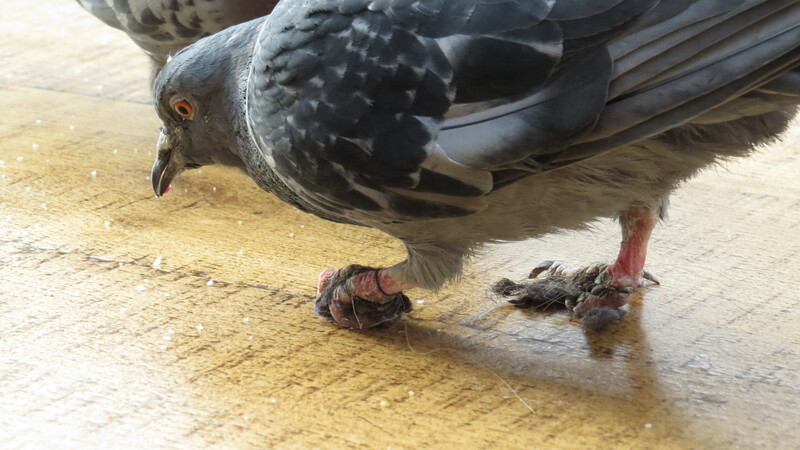 I have always been curious about why feral pigeons end up in such terrible condition. 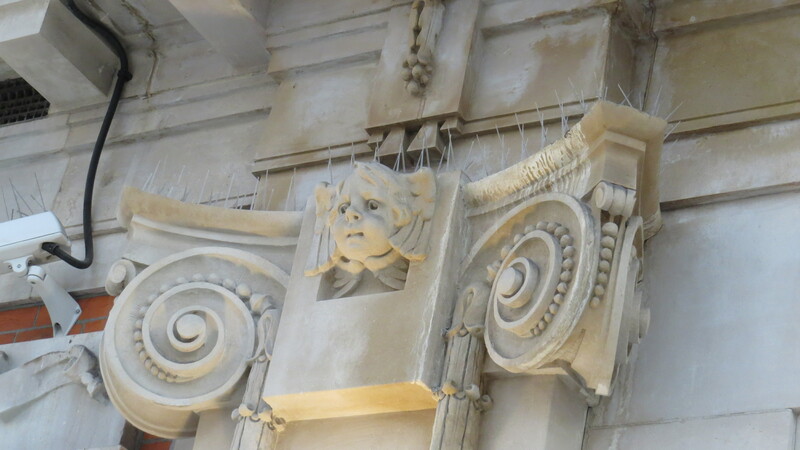 There are several theories: bacterial infection, chemicals used to deter the birds from landing on prized stonework, or even hereditary diseases. But one look at these individuals and it’s quite clear that what’s happened here, at least, is that the feet have become entangled in some kind of thread. This will tighten, attract other rubbish and infections, and eventually lead to the loss of toes or even the whole foot. How they become so enmeshed in the first place is another question. I suspect that some of it occurs when pigeons attempt to land in places protected by fine netting. This is used to dissuade the birds from roosting or nesting on buildings, or to protect garden crops. They may pick up some thread when they pick through litter as well – something as fine as a human hair is enough to cause damage. 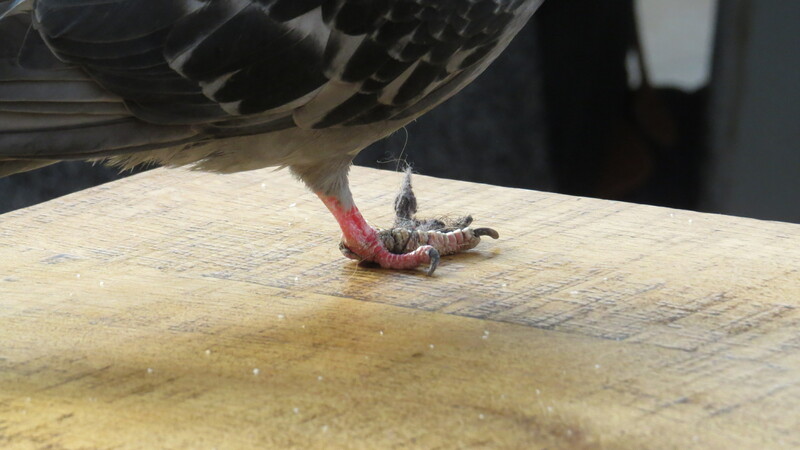 Add to that the ‘anti-pigeon’ chemicals which are used to dissuade the birds from landing, and the sticky coffee spills that they often trudge through, and this is enough to form a kind of terrible shoe that will make it more and more difficult for the bird to preen or even to walk. I suppose the question is, does anybody care? 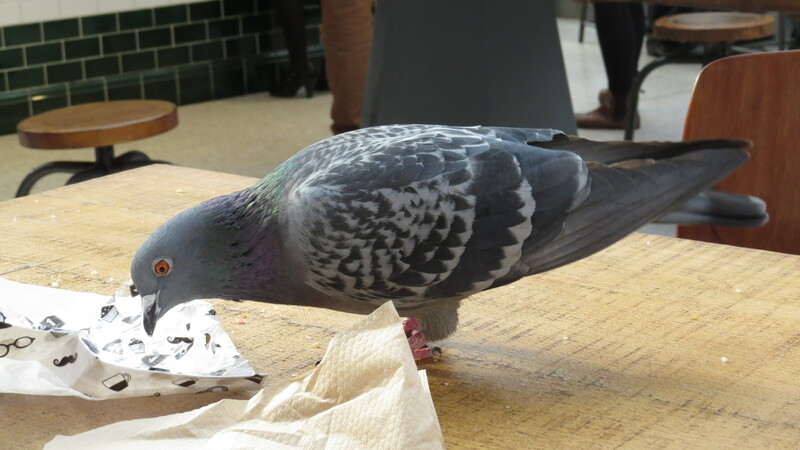 Most of our public spaces operate a kind of Arms War against pigeons. 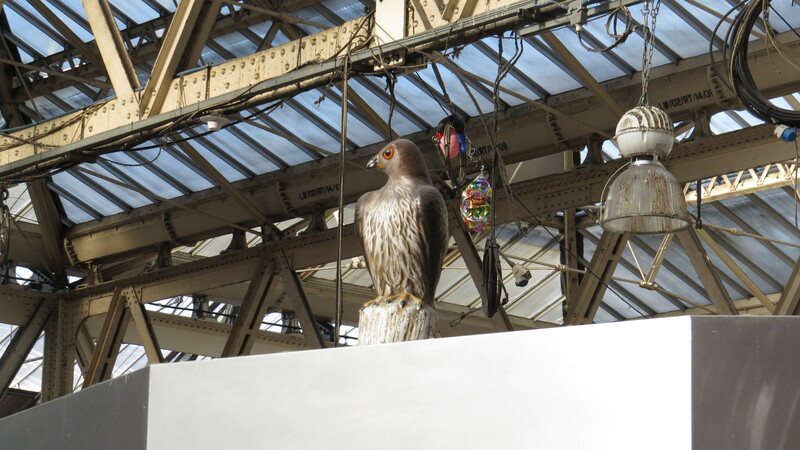 Let’s have a look at some of the anti-pigeon measures here in the station. More anti-pigeon spikes. With a baby pigeon sitting behind them. About thirty years ago, my mother was sitting in Finsbury Square in London having her lunch. As usual, she was sharing it with the pigeons. One had thread tangled around one of its feet. As my mother watched it hobbling about, she felt that she had to do something. She had a pair of nail scissors in her bag, but being on the verge of retirement she was not quick enough to catch the bird. Plucking up her courage, she approached a besuited chap sitting on a nearby bench. He looked at her for a long minute, as if trying to work out if she was serious. “Touch that?” he said. “You must be mad”. And so, in a single exchange, we see that the world is divided into those who think of pigeons as living creatures, and those who think of them as ‘feathered rats’. There are some vets who will help feral pigeons, should you find a bird that needs help, and there is also Dove and Pigeon Rescue, which has a lot of useful information not just about feral pigeons, but also about collared doves, woodpigeons and our rarer native species. Feral pigeons remind me of Dickensian urchins, always alert to an opportunity. 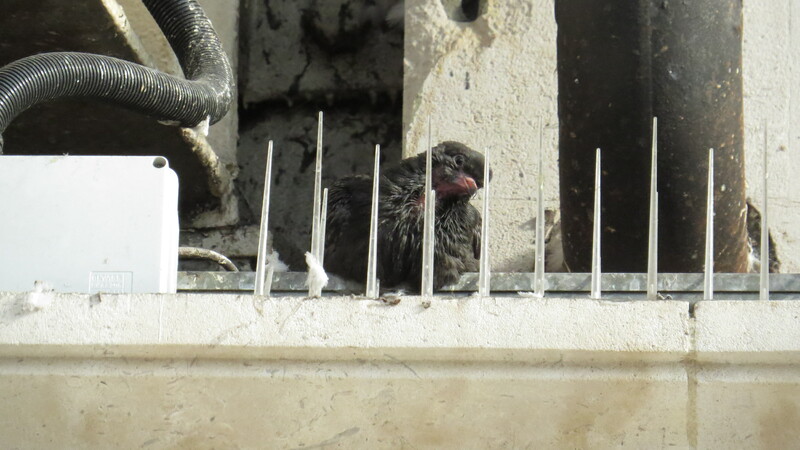 In Waterloo, they wait amongst the anti-pigeon spikes, watching one another and snatching up the smallest, briefest chance of food. They are marginal in every sense, unloved and unwanted. 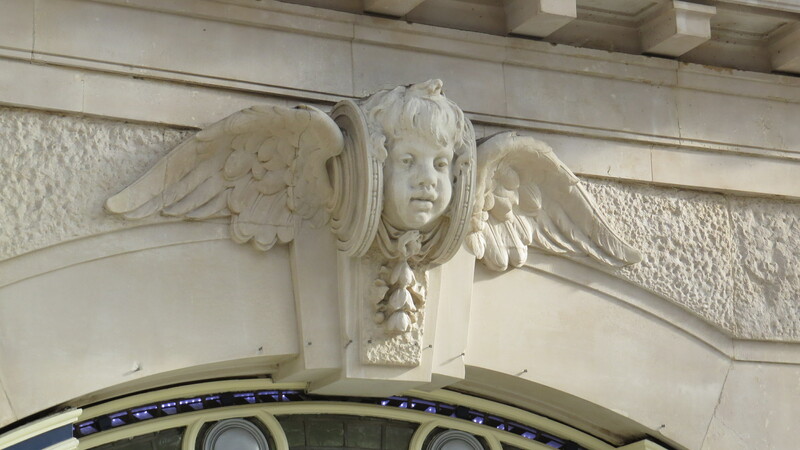 We love most things with wings: angels, cherubs, robins, eagles, even doves. But pigeons are an exception. Maybe, as we flap at them with our newspapers and shove them away with our feet, we’re seeing our own worst fears – of being outcast, homeless and forced to hassle for a living. I was once on a bus travelling along Euston Road, when it came to a sudden halt. There in the middle of the road was an elderly lady. She wore plastic bags over her sandals, and was shouting to herself, occasionally stopping dead to harangue some invisible enemy. But circling over her head was a flock of pigeons, accompanying her as she walked like an aerial guard of honour. When she finally slumped on to a bench, they descended around her as she pulled bread from her pockets and began to feed them, gesturing at particular birds and admonishing others. As the bus pulled away, I looked back to see her finally settling back, her face calm, as the birds pecked around her feet. I had no doubt that the pigeons knew her, just as she knew them, and that there was a kind of fellowship between them. We are all just struggling animals, trying to survive the vicissitudes of life, but it takes a hard-earned wisdom to recognise the fact. 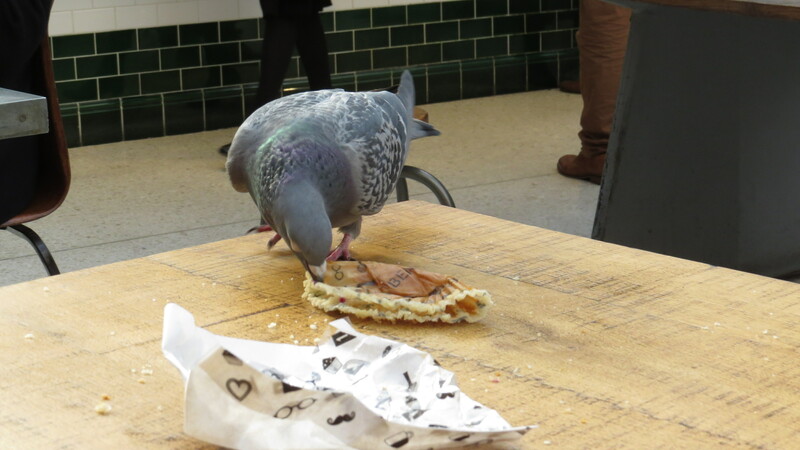 This entry was posted in London Birds on March 21, 2015 by Bug Woman. Bugwoman on location always conjures up the old “Mission Impossible” theme. I can see you with all the tools of your trade in hand. Love the photos and the writing. Great piece, as ever. I have a rather soft spot for our city pigeons and am always amazed how some of them keep going with their poor mangled feet. Chris Packham did an interesting feature on them on Spring/Autumnwatch a year or so ago and I remember reading an article once which said that most zoologists, if given the choice between saving a pigeon or a peregrine, would go for the pigeon because of their fascinating social structure and behaviour! Hi Caro, thank you! 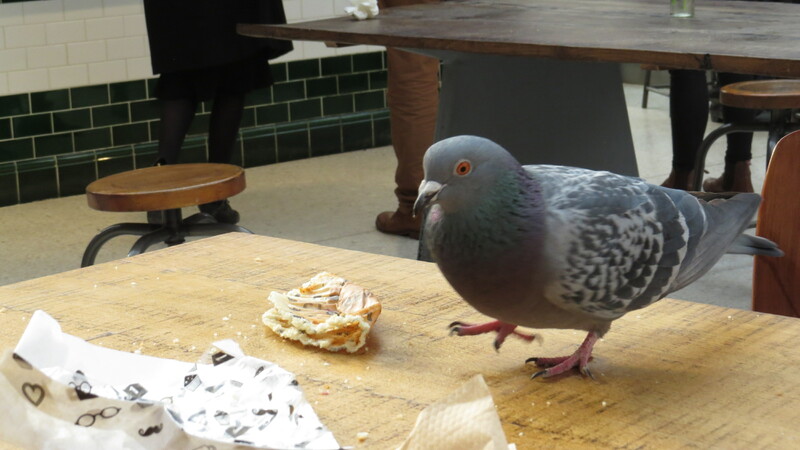 I am fascinated by pigeons – they have so many interesting social behaviours, as you say. I never get bored with watching their shenanigans. 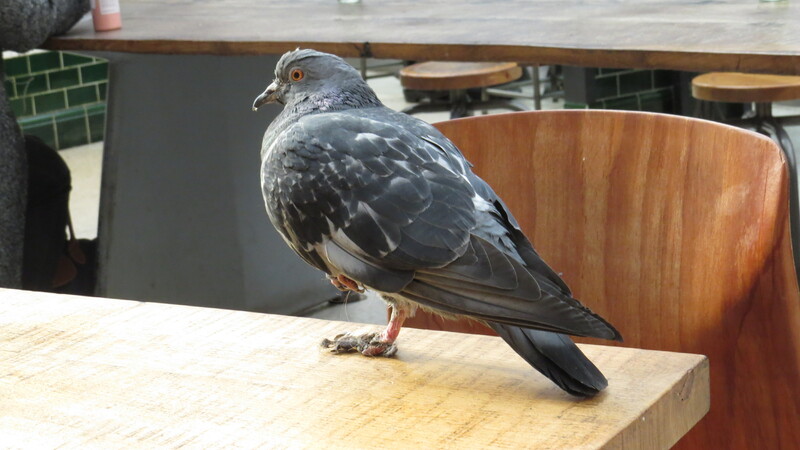 Great post; those pigeons with the snarled feet need to be rescued and treated. I love pigeons and just recently rescued 2 chicks that fell from a nest. 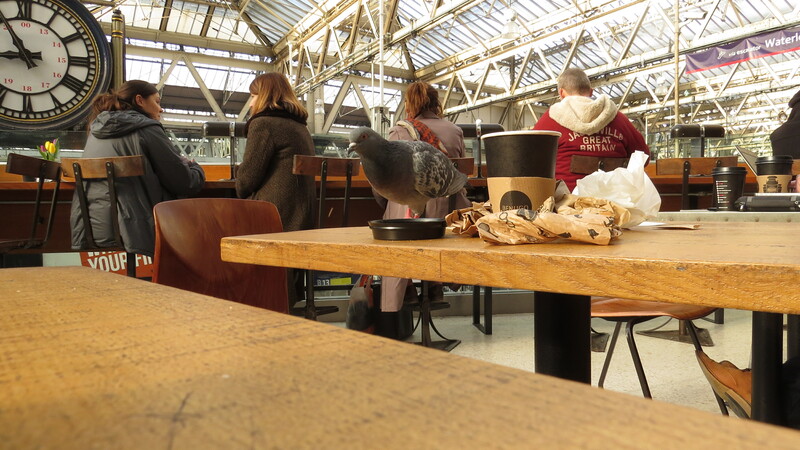 To be honest, I don’t care about the people who sit on the tables where pigeons might have pooped. I care more about the pigeons. Hi Maria, you are a woman after my own heart.